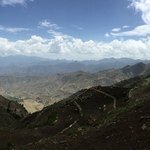 The drive to Debre Libanos leads across the highlands north of Addis Ababa. It offers a glimpse into the lovely village landscape of Ethiopia, and then suddenly drops open into a 1,000 m deep gorge at Debre Libanos. You'll take a short rest at the top of the gorge, keeping your eyes open for various bird species. On a short hike (1.5 to 2 hours), you'll cross an old bridge built for commercial purposes in order to arrive at a terraced waterfall and caves inhabited by monkeys. 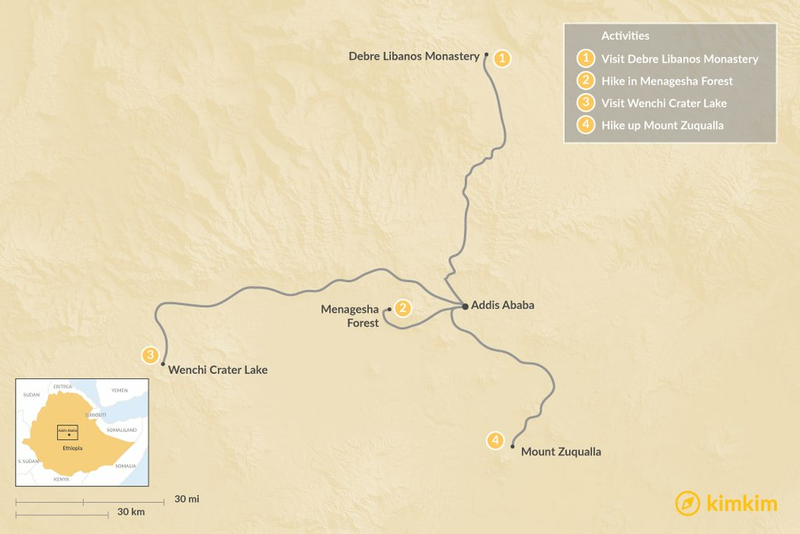 In the afternoon, we'll visit the sanctuary where the famous monastery of Debre Azbo (later Debre Libanos) was founded in the 13th century and destroyed in 1937 during the Italian occupation. We visit the octagonal church with the glass-paintings of the artist Afework Tekle, who also designed the windows of the Africa Hall in Addis Ababa as well as the newly built museum in which art treasures of the monastery are shown. 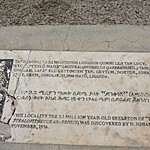 Drive west 30 km from Addis Ababa and you'll reach the entrance of the protected Menagesha Forest. On a 2-3 hour hike, we will explore the forest with its typical plants such as the Giant juniper, Giant lobelia, heather and Giant ragweed. Some of the oldest trees are over 400 years old. In addition, wild animals such as Guereza monkeys and Menelik bushbucks can be observed. Before heading back to Addis Ababa, we can visit an abandoned compound with an old sawmill. Finally, after leaving the forest, we can make a stop at the Meta brewery, sit in the green garden with a fresh beer and have a look and some photos at the nearby waterfall. Take a day trip to the northern Crater Lake Wenchi. Here, we have a 5-6 hour hike (or riding tour) through the beautiful countryside. You'll walk down to the crater lake before crossing the lake by boat. On a small island, we'll visit a monastery and church. From the opposite side of the lake, we start our way back through a lovely green valley with numerous clear water springs and small streams. The route takes us past corn mills powered by water and are still being used today for processing teff, a local type of grain. In the late afternoon, we return to Addis Ababa. 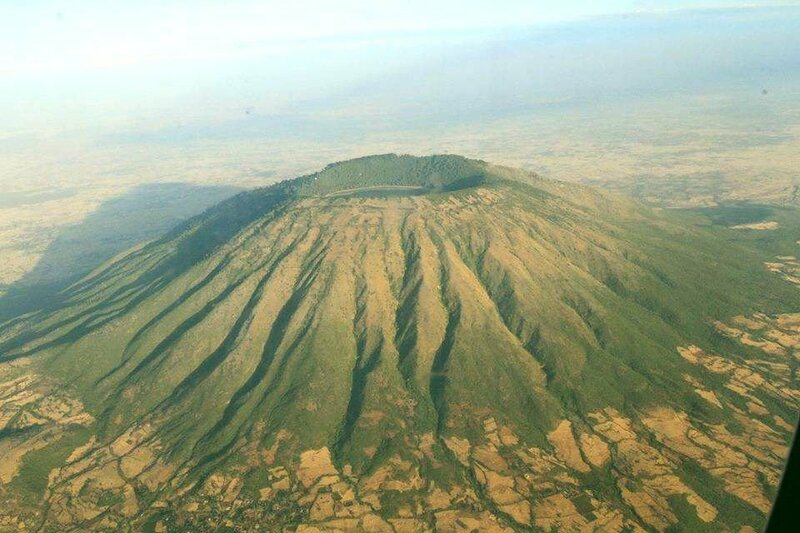 Early in the morning we drive south from Addis Ababa to Debre Zeit and then to the feet of the extinct volcano Mount Zuqualla. To visit the Zuqualla Monastery, founded in the 4th century and situated on the top of the mountain, we have to hike for about 4 hours and gain a height difference of about 900 m. We advise being in good physical condition to do this hike. Situated at the top of the mountain at almost 3,000 m sea level, there is also a lake surrounded by a beautiful forest which is considered to be holy. Here we can enjoy the wildlife, such as the Colobus monkeys and the endemic Menelik’s bushbuck, as well as birds, including the endemic Ethiopian oriole and Abyssinian woodpecker.